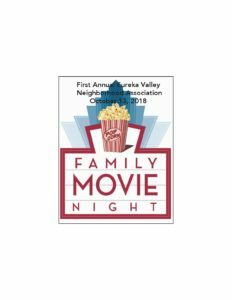 That's right- Eureka Valley Neighborhood Association is hosting our first ever neighborhood movie night on the lush grass at the Rikki Streicher baseball diamond at the EV Rec Center, 19th and Diamond Streets. Local families, park setting, bring your blankets and beverages (non-alcoholic). We've got the plans coming together, and it's gonna be a lot of fun for the whole family. No, I'm not telling you the movie title just yet! I'm looking for 6 more volunteers to help our current crew with the event. You'll need to be available Saturday 10/13 from 5pm to 11pm (or the better part of it). Duties will include various tasks: set up, info table, popcorn crew, greeters, safety detail, monitors, tear down, trash pick up. Email me: mark.mchale@evna.org or message me via Facebook!